Eating Disorders: What is it, Symptoms, Types, and Treatments. In Western society, we are constantly surrounded by the notion that being physically thin is desireable. It is not uncommon for people to think or worry about their weight at times. However, a constant and excessive preoccupation with your weight can lead to physical and mental health issues. The three main eating disorders include anorexia nervosa, bulimia nervosa, and binge eating disorder. However, there are also atypical eating disorders such as purging disorder, and night eating disorder. Eating disorders typically begin in adolescence or young adulthood, and affect women 10 times more than men. People who develop eating disorders typically have a family member who has also struggling with an eating disorder. Other predisposing characteristics of people who develop eating disorders include lower self-esteem, poor body images, perfectionism, and difficulties managing stress in everyday life. In Canada, anorexia affects between 0.5% and 4% of women, bulimia affects between 1% and 4% of women, and binge-eating disorder affects approximately 2% of both men and women. 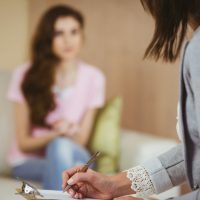 Dalton Associates can help you find a mental health professional with expertise in treating eating disorders to help you develop the skills you need to manage challenging emotions and experiences, can teach you new and healthy coping strategies, and provide ongoing support. Statistics Canada. (2015). Eating disorders. An Eating disorder is an eating habit that is unhealthy and threatens the well-being and possibly the life of the person with the disorder.